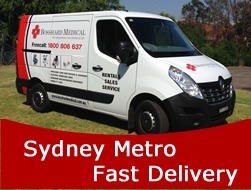 Bosshard Medical can deliver mobility equipment including electric hospital beds, pressure care mattresses and much more to most areas in the greater Sydney metropolitan area & Southern Highlands Bowral. For our rental customers we charge one price that covers both pick up and delivery to Sydney Metro area and Bowral, Southern Highlands. Please note that some items may incur an additional charge for equipment installation where more than one staff is required. Delivery costs are displayed on checkout.